My network of homeys, always on the lookout for treats when traveling, came through once again. This time the spoils were from London, hard candy style, and classic as all get out. 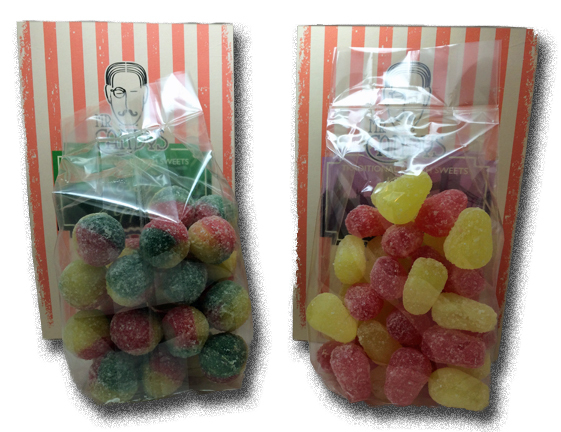 These two confections- Rosey Apples and Pear Drops, are iconic and classic boiled sweets. 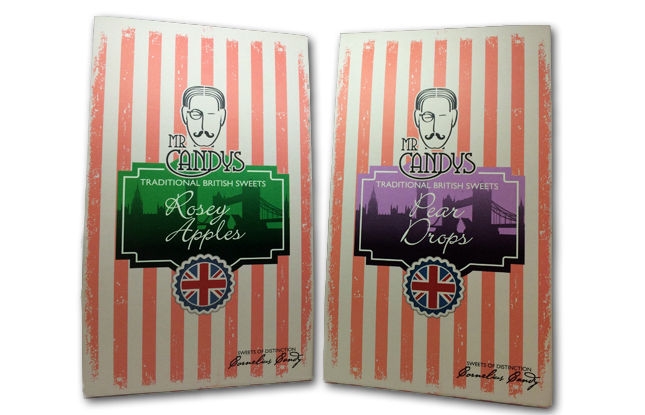 I’ve had both of them in various iterations, but I’d never tried Mr. Candy. I mean….his last name is CANDY so he’s gotta be good, right? Nice portion size inside each bag. And amazing colors too. However….the taste failed to impress-on both. Neither were bad, mind you, they just weren’t noteworthy. The Rosey Apples just looked so cool-textured, oddly colored…very fun. But man oh man, the flavor is weak. It’s apple to be sure, but it’s faint, underdeveloped, and definitely not memorable. There’s no red apple brightness or green apple tartness, or Honeycrisp lusciousness. Having said all of that…they’re not bad. The thing is though, every time I ate one, I was disappointed. Somehow I kept hoping they’d get better, but…they’re not magic, people-just apples. The pears fared a bit better, but not by much. For me, pear is such a great candy flavor, as it’s distinct. 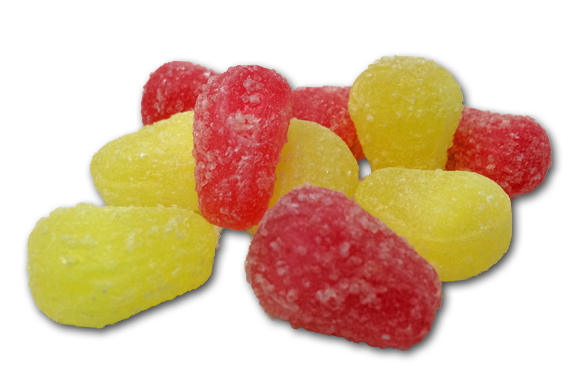 My first issue with these is that I couldn’t tell the taste apart between the red & yellow pears (red & yellow pears? Waa?). But that’s a minor annoyance. My larger complaint is the same as my problem with the apples- weak flavor. These poked through just a bit more than the apples, but still I was left feeling like they left a lot on the table. 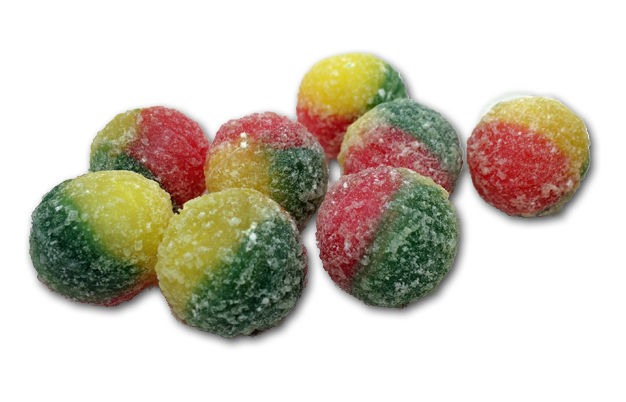 When a pear candy is good, it’s SOoooo good. These are mediocre, good for one or two, but again, their strongest impact on my was what was missing with them. 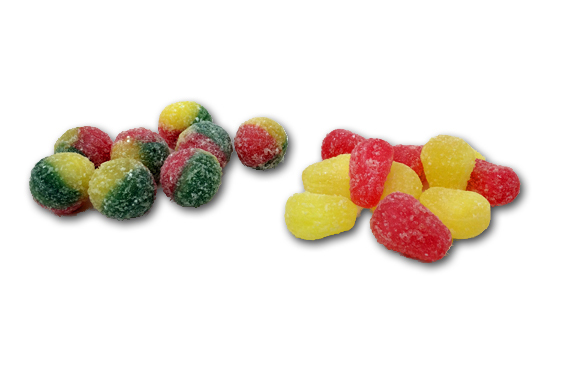 Both of these candies could have been helped with a bit of citric acid or other form of tartness to give some texture to the flavor aside from mild sweetness. As is? They’re fine, but..c’mon UK! We know you can do better!